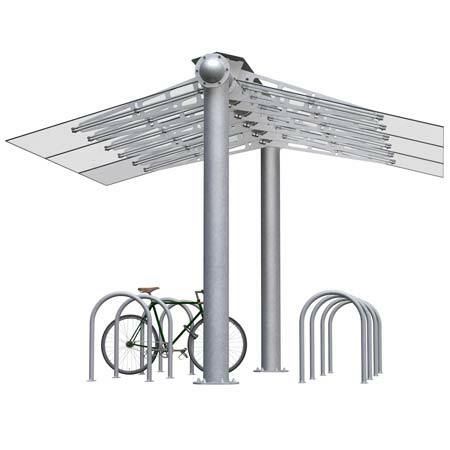 The Stratus Shelter™ is a striking bike shelter option for any transit station, university campus, or multi-family residential building project. It is constructed of American made, galvanized steel, and clear, tempered, laminated glass roof panels and optional side panels. Single or double-sided roof panels can be configured flush or in varying angles to create several attractive patterns. Adjustable positions create more options. The Stratus Shelter’s modular design makes it easy to expand. Available in galvanized finish only.